Safely carries a sizable amount of water, and is reasonably lightweight. The Canteen is a better, considerably lighter version of the Water Jar. It is one of the least expensive items that requires fabricator-crafted materials. 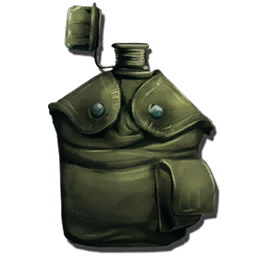 To drink from the canteen, highlight it in your inventory and select Use Item, or put it on your hotbar and press the designated key. This can be done 3 times for 100 water each before depletion, but only if your water isn't full. To refill the canteen, use it while standing in the rain or while standing in shallow water. You can also fill it by placing it in the inventory of a Stone Irrigation Pipe - Tap or Metal Irrigation Pipe - Tap. 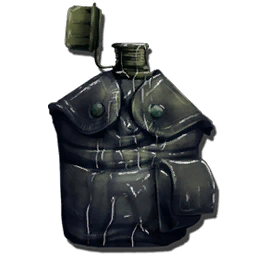 You can put a filled Canteen into a Refrigerator or a Tek Trough and will get an Iced Canteen after 60 seconds. 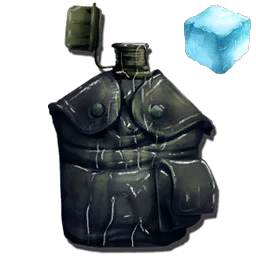 Drinking from an Iced Canteen increases your Hyperthermal insulation by 84 and decreases your hypothermal insulation by the same amount, which makes it easier to survive in the heat of Scorched Earth days, but more difficult during the cold nights. Once removed from the fridge, the Iced Canteen will "spoil" into a normal canteen after 10 minutes. However, leaving it in the fridge will extend the spoil time to what equates to almost 3 real years. Due to a bug the canteen couldn't be refilled in a tap before v192.0. In Primitive Plus 1.5 this engram cannot be learned. ↑ Nubsly (1 August 2015). "Canteens, Water Taps, and v192". General Discussions. ARK: Survival Evolved Steam Community. Retrieved August 1, 2015.